A spokeswoman for San Francisco’s Arts Commission says a controversial statue that will be removed from public viewing will be restored and put in storage until officials decide what to do with it. Commission spokeswoman Kate Patterson said Thursday the statue will be taken down as soon as possible but wouldn’t give an exact date, citing security concerns. The San Francisco Board of Appeals voted unanimously Wednesday night to remove the “Early Days” statue. It depicts a Native American at the feet of a Spanish cowboy and a Catholic missionary. 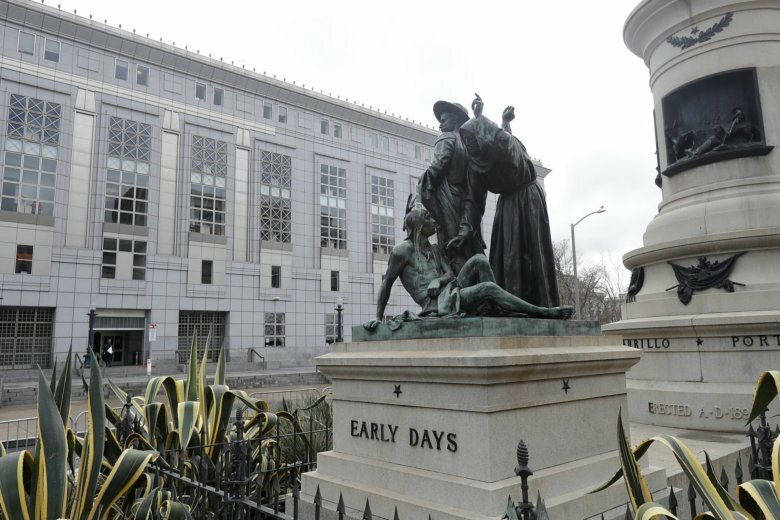 The San Francisco Board of Appeals voted unanimously Wednesday night for the removal of the “Early Days” statue. It depicts a Native American at the feet of a Spanish cowboy and a Catholic missionary. The statue is part of a group of statues depicting California’s founding. The board had voted in April voted to overturn a decision by the city’s Arts Commission to remove the sculpture. At the time, appeals board member Rick Swig called the statue “horrible” but said removing it would squash free speech.